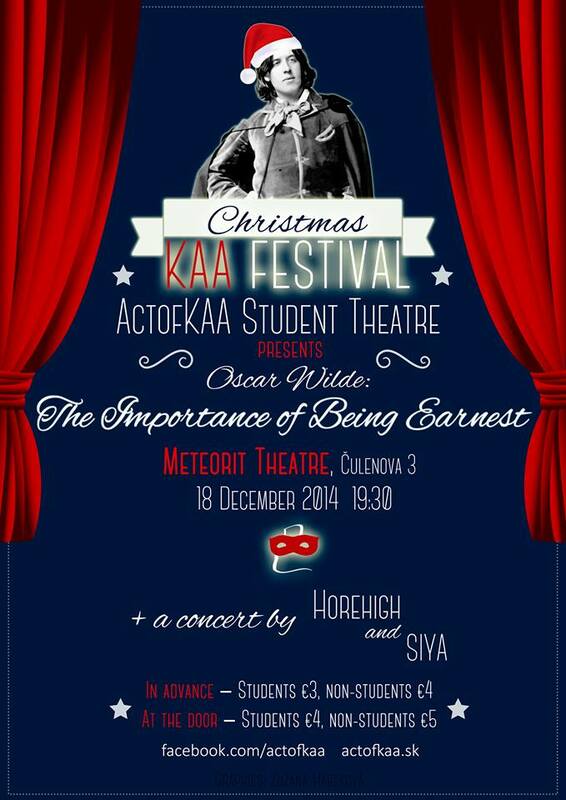 Winter is coming and so is the 4th annual winter festival of English drama, organized and performed by members of ActofKAA. This year they are performing yet another timeless classic – The Importance of Being Earnest by Oscar Wilde. This cynical, farcical comedy set in late Victorian London will win you over with it’s ridiculous but lovable characters, witty dialogues and complete lack of social responsibility. The plot revolves around two English gentlemen who use the same pseudonym (“Ernest”) for their on-the-sly activities. Hilarity ensues. So make sure you won’t miss it! After the play there will be further entertainment just like in the previous years. Musicians Horehigh and SIYA will perform. The program starts at 7.30 pm, so please, come in advance!